Foreign nationals in the Philippines are required by the law to get an Emigration Clearance Certificate (ECC) issued by the Bureau of Immigration (BI) before leaving the country. It is also called as Exit Clearance that is given upon request prior to departure as a proof that the foreigner has no pending obligations or derogatory records in the government. If you are a foreigner in the Philippines and you want to go back to your home country, this is a very essential document that needs to be acquired since without it, you won’t be able to leave. According to the press release on 2015, 33% of foreign national travelers were denied departure because of not having an Emigration Clearance Certificate. There are two (2) types of Emigration Clearance Certificate, the ECC-A and ECC-B. The ECC-B is the second type of Exit Clearance given upon request to the departing Immigrant or Non-Immigrant Visa holders with valid ARC I-Cards who are leaving the Philippines temporarily. The Bureau of Immigration recommends foreign nationals to process ECC three (3) days prior to the departure date. This way, if you have additional documents required or something needs to be done, you have at least 72 hours to process it. The charge fee for ECC Clearance is around ₱1,210 – ₱3,000. The Emigration Certificate Clearance is valid only for 30 days from the issued date and it can only be used once. For foreign nationals who needs to apply for ECC-A (review above for who can apply), the application needs to be processed at the Bureau of Immigration Office. For foreigners who needs to get ECC-B, it can be processed at the airport. Go to the nearest Bureau of Immigration Office in your area and bring your requirements. Wait for it to be checked and get your Order of Payment Slip (OPS). Submit your application form, requirements and original receipt/s and wait for your claim stub. On the scheduled date and time of return, present your claim stub to get your Emigration Clearance Certificate and Receipt/s. You’ll be asked to sign the duplicate copy of the ECC before the releasing of original Emigration Clearance Certificate and Official Receipt. 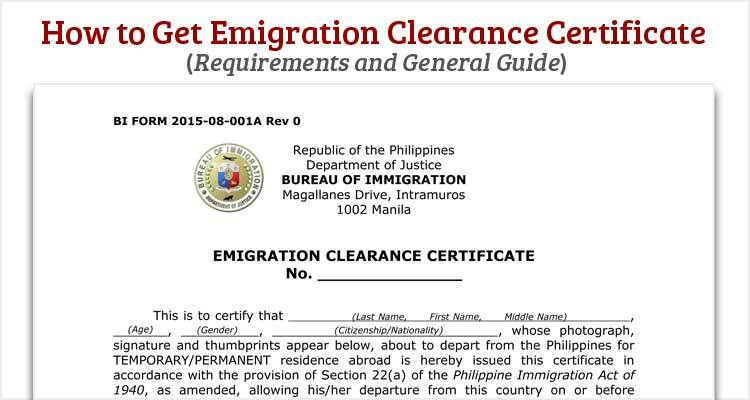 That was the general guide on how to get Emigration Clearance Certificate (ECC) or Exit Clearance in the Philippines. Did you successfully acquired yours? Let us know some of your tips on the comment section. What is an ACR-I card, and how to get one, for new born baby? I see there is a requirement for an ICR also! Any idea what that is, and how to get one?